How we relax can go a long way. Found some time to do a plein air study. All this rain and cloudy weather in SF is great for getting even lighting and seeing the local colors of objects. Painting in an overcast environment can also be useful in production. A painting with even, general lighting can easily be changed to text other lighting conditions, such as day, night or a strong spot light. Her mother’s armor lent her determination and confidence, but she could not shake the anxiety. She’d never shot at another human being before, and never wanted to. Projecting West Funded One Year Ago! One year ago today the Kickstarter for Projecting West was successfully funded! Craig and I will be sharing the adventure a year later for everyone to enjoy, so keep an eye on the internet! Little buddy has indeed come a long way. Tomorrow, June 2nd marks the beginning of DAY 1. For Unbound Evolution I liked the idea of a fish being artificially evolved using a combination of magic and science. After a few pages of explorations this composition was approved to move forward. Using an egg motif to signify the creature's unfinished development, I paired it with Frankenstein-esque lightning to contrast a natural and unnatural process of creating life. Runes are an attempt at control while the lighting shows us instability of the what I imagine is a risky and energy intense process! Time for 5 Star Friday No.6! I find Xmau’s use of graphic shapes, urban subject matter and visual style totally rad. The opposite of what it looks like, Space Dandy is a cleverly disguised commentary written by Dai Sato on all of the tropes that many many anime less than savory. Unfiltered ridiculousness and creativity, there are more also callouts to other media than I have ever witnessed. This show is a masterpiece. To a self taught artists this book is GOLD. When learning a new field, the technical terms both the most important and most elusive. This book is like a giant keyring to the kingdom of design. 125 terms + explanation + links to related terms. GOLD. Gratitude goes a long way. The 5 Minute Journal is a fantastic resource for cultivating a more optimistic and positive mindset through reflecting on what is great in your life. I’ve been using this method for two years and can honestly say I’ve seen a difference. You can get The 5 Minute Journal is both print and app form. If you'd like future Five Star Fridays delivered neatly to your inbox, sign up for the newsletter. You can also help by spreading the word on Twitter & Facebook! 5 Star Friday No.5 is here! Tsutsumi’s work is colorful, playful, and wonderful! I was introduced to his work via a flier at Kinokuniya SF. This Saturday 5/21 Tsutsumi and Robert Kondo will be speaking about their experience leaving Pixar, forming Tonko House and creating The Dam Keeper. If you attend, come say hi. The beautiful art, compelling story and poetic dialogue keep me coming back every week. I was hooked three years ago when a friend sent me it’s second test page. Its also got a great protagonist. What can a comic offer me, next to all of that? Some great thoughts on introducing characters. Kennedy uses the scene from The Big Lebowski where both the viewer and characters meet Jesus Quintana. After reading this article, I’m convinced this scene is BRILLIANT. His note on the scene's music is probably my favorite part. Primer is an amazing resource for picking up some marketing knowledge. Even a 5 minute commute to work is enough time to open up the app and learn something valuable. Highly recommend checking this out. “Appeal to Searchers and Search Engines Using SEO” and “Finding a Name That’s More Than Just a Name” are two of my favorite exercises. Below is 5 Star Friday No.4. Enjoy! Zedig’s work overflows with wonderful personality and unbound creativity. Not only is his work amazing, but he also makes music. Some of us just have it all. ⭐ A Helpful Artist’s Thoughts: Justin Oaksford’s Discussion of Craftsmanship. Justin discusses the difference between learning superficial style and rendering (polish & Craft) techniques and being cognitive of the decisions you are making as an artist (Foundations). It’s a great video for anyone starting out, and a wonderful reminder to anyone more advanced. I used then when I began teaching myself concept art and visual language. Not only is it filled with great information, it includes a “Simulated Art Director” exercise to help keep you sharp. I’m not sure where I first found this song, but its beautiful, and queing up Lei Qiang’s work while working will bring you to a calm, wonderful place. If you enjoyed this and would like future Five Star Fridays delivered neatly to your inbox, sign up for the newsletter. If you’d like to help me spread the word, tweet about it! For your reading pleasure, here is 5 Star Friday No.3. I’ve been a huge fan of Tom’s work for years. His impressionist style combined with a highly efficient, exploratory workflow make for some truly beautiful and mood filled work. Last year his #MaySketchADay challenge became a tangential catalyst for Projecting West with the amazing Craig Winslow. You can hear more about his thought process (which is also wonderful) during his interview with Ash Thorp on the Collective Podcast. He is also the NICEST guy. Show Your Work is fantastic guidepost for anyone curious how to share their work in a productive manner. I’ve read this book several times over, and continue to check back in with it when I want to up my sharing game. It’s a quick read with clever infographics, perfect for keeping on your phone (I own the kindle version) ready to review at any time. Not only does Gabo make wonderful art consistently, but the process for making the art is shared too. Mistakes, thought, story behind the piece. Its great to hear the thoughts from someone who has done work for studios like 343 and Oculus. I’m not sure if you know this yet, but the cyberpunk future is HERE. Last week I had the great pleasure of visiting my friends at The Soap Collective, who prompted me to try Tiltbrush, a VR art program. It’s AMAZING. The best way I can explain it is the sensation of drawing in the darkness with sparklers combined with a drawing program. There are various brushes made of stars, to fire, to paint, leaves, and neon light. Last night I heard two of the heads of Titmouse speak about tiltbrush. They've been helping the Tiltbrush team develop new tools. I can’t say what they’ve been working on, but I can say it's going to be REALLY COOL. Week 2 of Five Star Friday! Let’s get started. ⭐ A helpful Resource: Google Cultural Institute / Google Art Project. High resolution images of masterpieces from around the world in a myriad of disciplines! It’s amazing! Great for looking at works though history, studies, and general inspiration. History is packed with fascinating things. Here is my collection of Old Master Painters with Beautiful Color. An anonymous group of Art Directors answer your questions to help navigate artistic and professional problems. There is so much frank and wonderful advice in here. Both of Supergiant’s previous titles, Bastion and Transistor were wonderful. Filled with beautiful art and dynamically narrated by Logan Cunningham, (who has a wonderfully gruff and soothing voice) were wonderful places to discover narrative through. Although we don’t know too much about Pyre yet, I’m excited to see yet another beautiful world from them. If you enjoyed this and would like future Five Star Fridays delivered neatly to your inbox, sign up for the newsletter or tell two friends! I'm conducting an experiment: For the next few weeks I'll be sharing 5 things at the end of the week I've found helpful or inspiring lately. The format comes from Tim Ferriss' 5 Bullet Friday, which I really enjoy. I found myself wishing a creative version existed, so voila! If people find it useful, I'll keep it going past May. To get it delivered right to your inbox each Friday, Sign up for the mailing list. If you find it helpful, help me spread the word and share it with a friend or two. Have suggestions for helpful resources or inspiring work? DM me on twitter! you might see it in a future post. I found his work while doing research for Role. I love his colorful palettes, strong graphic shapes and the playful nature of his work. Beautiful, fun, and intriguing. The wordless narrative, and intriguing world had me immediately hooked. The gameplay can be difficult at times, but REALLY rewarding once you get comfortable. Pro tip: Remember where you find health packs. ⭐ A helpful book - Framed ink by Marcos Mateu-Mestre. Great resource for learning visual language and how it relates to storytelling, and a great primer for storyboarding or beginning a comic. It blew my mind more than once! ⭐ Brain food: Satoshi Kon’s Opus + I could do that. Being aware of the context in which something was made is often just as interesting as the piece itself. The last chapter of Opus is entirely pencil roughs due to Kon’s sad and premature passing. The combination of the work and his life makes that last chapter far more powerful, and interesting. It’s a fun read, I suggest checking it out. 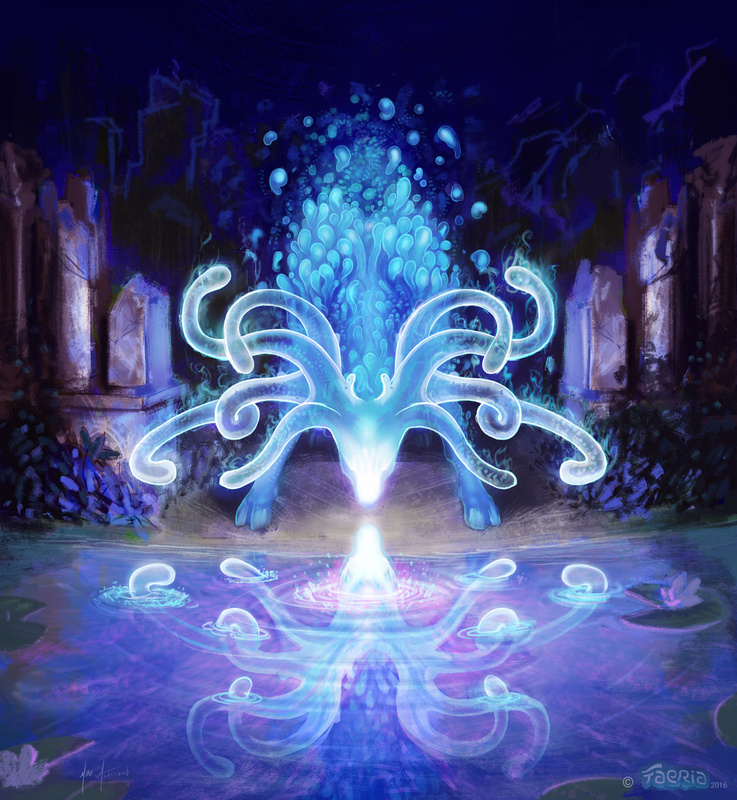 As Faeria continually evolves and artwork gets updated, I get the pleasure of revealing art I've done for the project. Today I share with you: Mirror Phantasm! Mirror Phantasm Creates a copy of itself when it enters play. Its great to work on a project I also enjoy playing. I generally describe is as a Magic the Gathering and Settlers of Catan lovechild. Its great. You can check out the game in Steam Early Access. If you enjoy this illustration, stop by my Faeria page to see other pieces I've created for the world of Faeria. January and the beginning of February of this year were spent froliking around Thailand with my wife, meeting wonderful people, eating spicy food and collecting reference images to share with all of you! I've finally made it back to the US (and the internet for that matter) and am prepping my first reference pack to give away. I'll be adding it to my Gumroad page, ala Noah Bradley style. The images will be released under Creative Commons, so you can use them how you'd like! If you'd like to hear when the pack drops, some handy things I've learned, and the occasional project update (my life isn't that exciting) sign up for my newsletter! Would you be willing to trade a vice for progress and success? Nothing is actually free, so why not pay with something we are in excess of, and don't actually want in the first place? In my experience the root of sustainable motivation is either love or desire. I love to make art, to spend time with my friends. I desire a fulfilling career. Coming to an emotional understanding that we can exchange something we feel less than great about for something we really truly want is a powerful tool. Recognizing when we step into the bounds of excess, we are able to use these moments as opportunities to change course and get closer to our goals. By no means should we completely stop the source of our vice, it just means trading that extra hour ofDestiny for an hour of studies, trading that extra dumpling for a slightly healthier body. Over time these small acts accumulate and accelerate us towards our goals. If you'd like to give it a shot keep a piece of paper with you for 21 days. Make a note whenever you realize you are slipping towards excess: Write down what the activity is, and what you were doing before you realized. Write your goal on the back, and a contingency plan for what you are going to do instead. Try to keep the latter activities related. If you are grabbing an extra Oreo, grab a glass of water. If it's an extra hour of Destiny because its fun and pretty, look up the art online and do a study or two instead. Better yet, try to find who the artists who inspired the artists at Bungie and do studies of their work. If you'd like to take your understanding of habits to the next level, check out The Power of Habit by Charles Duhigg. I've read it, its great. I'm starting a newsletter to share what I've learned over the last 4 years since I jumped ship on 3D and began practicing the dark arts of concept art and illustration. My goal is to pay it forward and help other artists/creatives reach their goals by surfacing things I've learned and found helpful. I'd love to ship these out to anyone interested, so please sign up and check it out! Yeah, Drop some monthly knowledge in my inbox! This post can also be found on Medium. My response was not having enough money to pay my bills, which is true during dry spells of the year. He reassured me “name me someone self employed and starving,” noting the tenacity most people who run their own businesses tend to exhibit. This realization made me feel better, since we freelancers are in control of both our work and finances. It’s pretty easy to forecast when things are going to get rough and avert course before things actually ever turn serious. As a new part of my morning routine I've been meditating for the last 6 days. This morning my meditation practice moved away from scanning the tension in the body, and asked to scan the tension of the mind. To my surprise I found a hard space in my mind. I'm a visual/spatial thinker so when I encountered this hard space it looked and felt like bone, shivering and organic. Apparently this is what my emotional landscape looks like. I realized I have been unintentionally calcifying an emotion, guarding myself from some kind of fear. Trying to crack it open to find out what was inside wasn't working, so I listened to the vibrations. It sounded like the kind of shivering that comes from desperation and fear of harm. I immediately realized there was something I was more afraid of more than losing money. Sharing myself mixed with some form of imposter syndrome. My greatest fear is sharing my process, my life, then being discredited by others. Not that people will get angry at me or flame my posts, but that they will look at it and walk away with the impression I'm some lesser form of artist, not worth their time. That I will be left here, alone with my tablet, with no one willing to help support my future ambitions. Following the meditation I opened my eyes, suddenly I was back in my studio, sitting cross legged on the chaise, staring at the door. Courage does not exist without fear. In fact, I’ve found most of the time what we fear most is what we need most. So I'm going to master this fear, crack the callus, one post at a time.